German shooting guard Kostja Mushidi and Lithuanian wing Arnoldas Kulboka are perhaps the two biggest names at this year's camp among players potentially eligible for the 2017 NBA Draft. Mushidi is coming off a strong showing at the Hoop Summit and some of his best single-game performances of the season with Mega Bemax. Scouts will be looking to see if the long, strong guard can continue to make shots at a strong rate from the perimeter and get his teammates involved. A strong effort here could solidify his standing, but it appears more likely that he will withdraw from this draft and try again in the future with another year of seasoning in the Adriatic League . -Solid IQ. Figuring out how to fit in within his role. Moves without the ball. Makes the extra pass. 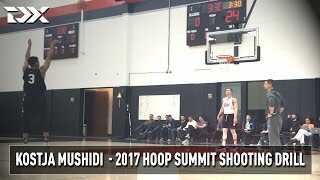 When Mushidi is hitting his 3-pointers, like he was in the Hoop Summit game, and at times in the practices, he has the makings of a very solid utility role-player. When his jumper isn't falling, he has a hard time making an impact, as he doesn't bring a great deal of high-level value in any other part of his game at the moment, even if he shows some potential with his length, competitiveness and solid IQ. There's a niche for players in Mushidi's mold in today's NBA, but he'll likely need to continue to gain experience in Europe and polish up his game before he's ready to make the leap over, which makes sense considering his youth. German wing Kostja Mushidi discusses his strengths and weaknesses at the U18 European Championship, with accompanying video from the tournament overlayed. The headliner of this group is Kostja Mushidi, one of the top prospects in the 1998-born age group that won't be eligible to declare for the draft until 2017. An athletic wing with a terrific body, Mushidi is a strong, multi-positional defender who has an intriguing, but unpolished skill-level offensively, Mushidi was born in Belgium but grew up in Germany before playing this season in France, which ended in some turmoil. Averaging 17.2 points over 29.7 minutes per game for Strasbourg's Espoirs team and helping Germany to victory at the Albert Schweitzer Tournament (where he was named MVP), this will be an intriguing glimpse of what Mushidi can do against more mature players for the NBA personnel in attendance. He is rumored to move from France to Serbia next season to play for Mega Leks, taking the same route that Timothe Luwawu did this year with great success.